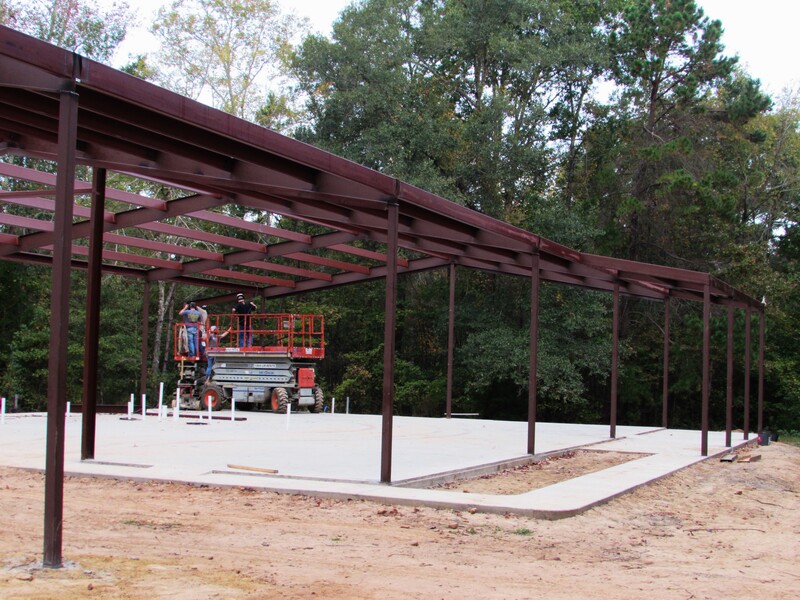 So, y’all know we have a slab poured. Next stop, frame work. I’m super excited about this for several reasons. In no particular order. 1. I can see my drawing come to life. 2. Addie finally realizes this will be a house with rooms, not just a slab with walls. 3. I can finally know for sure how big of a dining table I need to hunt for. I must say here, I have lived in and worked in very large houses over the course of my life. They are lovely, great and fun. But give me a small house ANY day of the week. 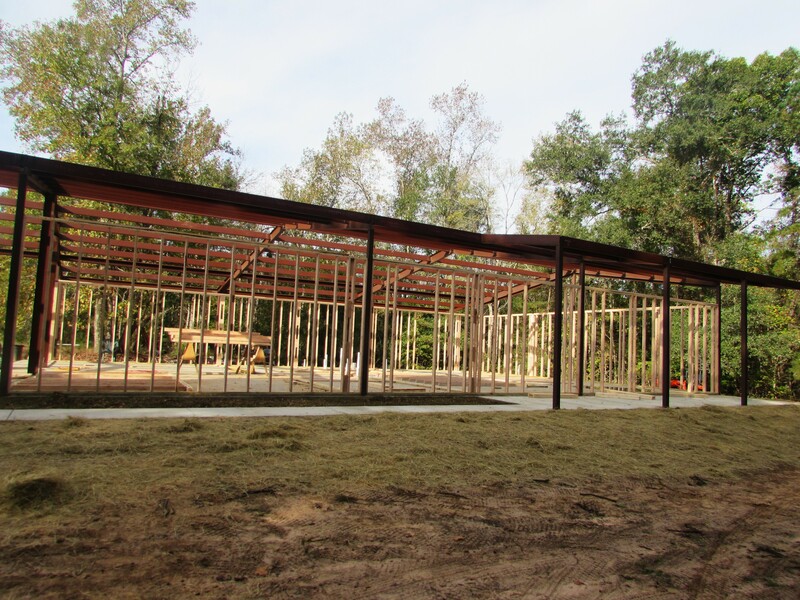 When we are finished, we will have 1,480 of living space plus another 1,000 feet of open space that will house the laundry, bar and tv area, processing kitchen and storage. I. Am. Stoked. The front porch, you see here to the far right, is 31 x 8 foot. The sidewalk wraps around my flower bed and all the way around to the back porch. 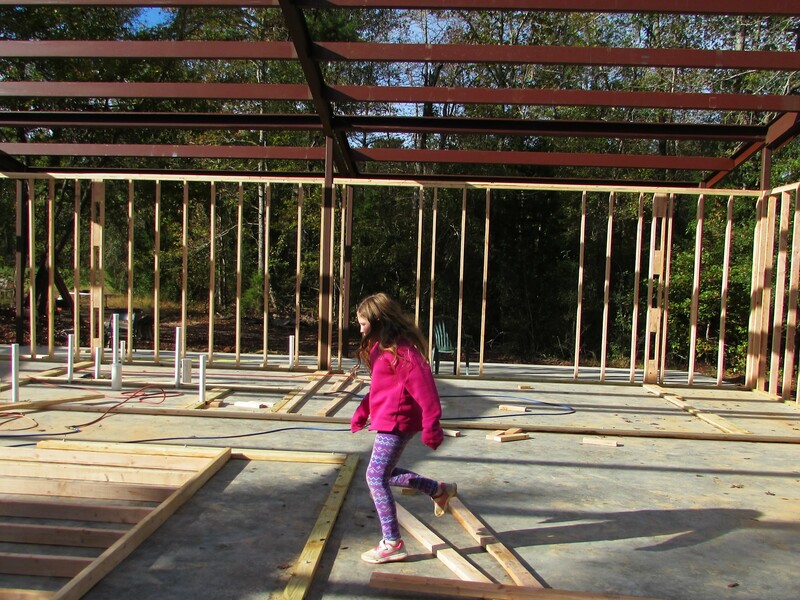 Windows and doors are going in…..
And Addie is almost as excited as me. Hopefully, all the frame-work will be done soon and I can show you rooms and maybe even walls! That is wicked exterior framework! Texas tornado resistant? I too like small homes! Of course being a man I only need space for my big chair, television, bed, shower, commode (#1 priority), sink and mirror, stove, fridge, freezer, bed, washer and dryer, hot & cold water, double deep sink, ac and heat, small table to eat at & probably won’t use it much as my easy chair makes food taste better and as I get older a bright lamp by the easy chair! I don’t need but about a foot long rod to hold my jacket and a suit for occasions that I have to be drug to! Otherwise a couple of boxes are fine to separate my jeans, shirts and socks/underwear! I wear work boots just about all the time but do keep a pair of dress shoes for the occasions where I’m drug to! I do need a huge shop to house a tractor and 90000 tools that for most of them I might need only once in my lifetime but I love tools! I got most of them because I run into situations to where I need a particular tool so I go buy it and then might not use it again but I have it just in case! Proud for ya’ll! May it go well in getting it done! Nice planning!